Needless to say, President Trump’s words angered many. Although the Federal Emergency Management Agency (FEMA) should be impartial when it reacts to a natural disaster, the tweet suggests that the President affects the amount of assistance FEMA provides. Has Trump be playing favorites, favoring red states over blue states? Have his negative views of Puerto Rico explain why the federal government has been slow at disbursing the funds appropriated to finance the island’s recovery? This is likely to become an issue in next year’s presidential elections. For instance, both Elizabeth Warren and Julian Castro have recently visited Puerto Rico to highlight the Trump administration’s “‘disrespectful’ treatment” of the island’s 3.3 million U.S. citizens. Do Americans share Warren’s or Castro’s views? 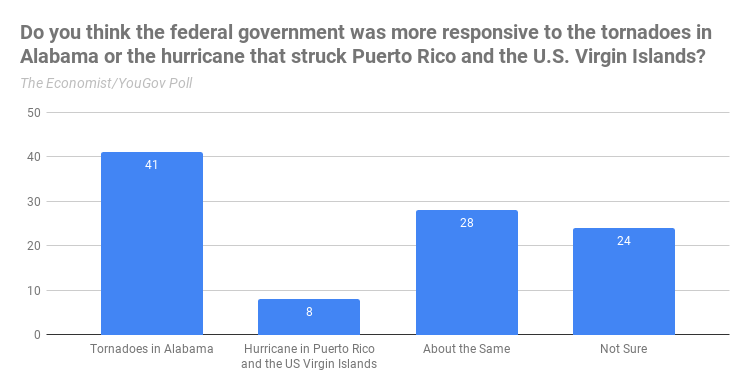 Sadly, but not surprisingly, many Americans think that the federal government has favored Alabama over Puerto Rico and the U.S. Virgin Islands. Could this be problematic for the White House? A close look at the survey’s crosstabs show that 66% of Democrats believe the federal government favored Alabama over the other U.S. territories, while only 32% of independent and 28% of Republicans share this opinion. 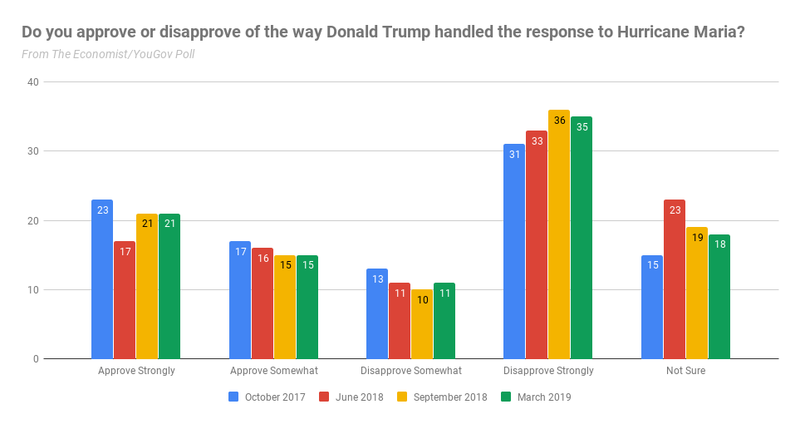 The survey also asked respondents to evaluate the President Trump’s and the federal government’s response to Puerto Rico after Hurricane Maria. This is the fifth time this survey posed this question, allowing us to track Americans’ attitudes for the past 18 months. The numbers have not fluctuated too much since YouGov asked this question in last year’s surveys. As noted above, partisanship determines how negatively respondents feel about Trump’s handling of the response. Thus, 80% of Democrats disapprove of his response, while 77% of Republicans approve of his performance. Independents, an important voting group, are more divided with 31% approving and 39% disapproving of President Trump’s actions. 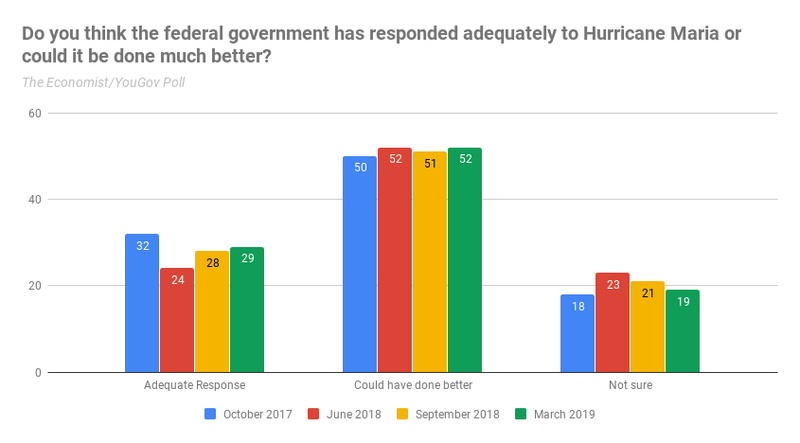 Respondents were also asked to rate the federal government’s response to Hurricane Maria. As noted above, there is not too much change in the last few months. Republicans are more likely to have positive views of the government’s response, while Democrats are more critical. Today, 43% of independents tend to be critical, though this represents a 4% drop from September 2018. How salient is this issue? Will it affect the 2020 presidential elections? Right now, other issues will likely overshadow the Trump administration’s treatment of Puerto Rico after Hurricane Maria. But this issue will prove be problematic with President Trump in Florida, a state he needs to win if he hopes to win reelection. Author’s Note: A version of this post is also found in the The Puerto Rico Data Lab, a blog I created to reflect on US-Puerto Rico relations in the aftermath of Hurricane Maria. You can follow me in Twitter at the following accounts: @cyordan or @pr_datalab.